I am someone who is always looking for new ways to use old items and I love to see how other people find ways to do the same. I have to admit, I laughed when I first saw this, but I was also impressed. 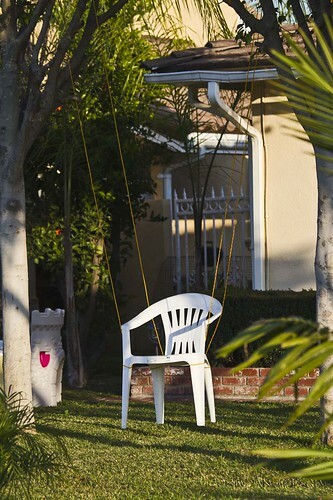 Someone at this house wanted a chair swing, so they made one quick and easy! How inventive--though I'd like the look of it much more if they sawed the legs off after the inch or so needed to keep the ropes in place. But then it wouldn't make a useful chair anymore, after they're done using it as a swing. Ha, clever use of the chair.